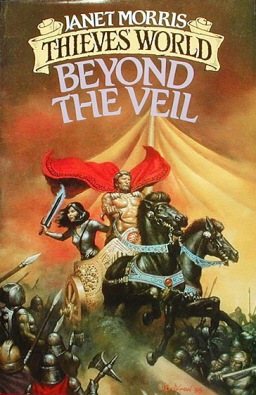 Originally posted on Black Gate Adventures in Fantasy Literature. 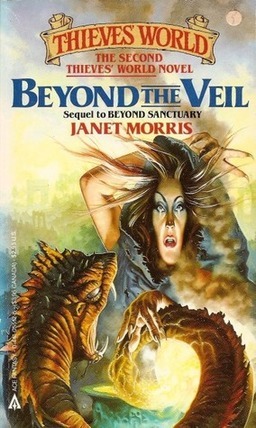 I continue with my review of the 5-star, Author’s Cut editions of Janet Morris’s classic of Homeric Heroic Fantasy, the Beyond Sanctuary Trilogy, of which Beyond the Veil is the second book. Once again, she does not disappoint in this stirring novel of political and religious intrigue, dark magic, gods and men, witches and mages, and the price of love and war. This is a pivotal book in the trilogy, where foreshadowing and story threads begin to weave in and out to form a tapestry, telling a tale of friends who become foes, enemies who become allies, and what fate lies in store for certain demigods and mortals. It begins with the murder of a courier on his way to meet with Tempus, and the arrival of a young woman named Kama, of the 3rd Commandos, (a unit of special rangers originally formed by Tempus) who seeks audience with Tempus, who is also known as Riddler. Her mission is to take 11-year old Shamshi, the young wizard-boy, back home to Mygdonia. Shamshi, once a pawn in the game played by the late sorcerer Datan in the previous novel, is still under the spell of Roxane the witch, but is now being held as a guest-hostage by Tempus and the Sacred Band. Though he may be a child in the eyes of men, Shamshi is already plotting against Tempus and Niko. He is guided and goaded by the “voice” of Roxane, who has been in hiding since the death of Datan, her former partner in crime, and the loss of Wizardwall at the hands of Tempus and his Stepsons. Roxane has her own agenda, of course: she is one of the most seductive, dangerous and deadly foes in this trilogy. To further complicate matters, Shamshi is in love with Jihan, Froth Daughter of the weather god, Stormbringer; she has come to Earth to spend one year as a mortal, and Shamshi can’t wait to grow into manhood so he can take her for his own. Even though Roxane has already introduced him to the pleasures of the flesh, Shamshi knows he must wait to seduce Jihan, wait until he is a man full-grown when she will accept him as such, or so he believes. Tempus, still without the patronage of Enlil, the Storm God of the Armies, is weakened and uncertain, and concerned for Niko, his right-side partner, whose life and fate hang in the balance. He sends young Randal, the seventh-level Hazard Class mage who proved his worth in the battle of Wizardwall, to the Bandaran Isles to find Niko, who has gone into retreat there. Together, Niko and Randal then travel to mystical and mysterious Meridian, where they meet with Askelon, Dream Lord and regent of the seventh sphere, who seeks Niko’s aid and offers him his patronage. Reluctantly, Niko agrees to become the avatar of Askelon who says he wants “to secure the stability of the seventh sphere through its human connection, to prevent the possibility of someone threatening the right of man to dreams of comfort and healing.” But is that all the entelechy of dreams and shadows wants? Or does Askelon have a hidden agenda that is yet to be revealed? Are gods to be trusted any more than men? And let’s not forget about Roxane, the snake-eating, soul-devouring witch whose grim shadow hovers over all. She wants Niko for her own; she seeks to regain Wizardwall for all her kin, and “to find out if Tempus is truly immortal and whether a Froth Daughter might be turned to drizzle upon the air.” And young Shamshi is her tool, her weapon against Tempus and Jihan. As I stated earlier, this is a complicated novel, rich and complex in the machinations of its characters, whether they’re mortal, divine, or numinous, whose motives may or may not be what they seem. It begins with a mystery and keeps that going throughout the story. The reader knows only as much as what the characters know and learns things only when the characters learn them. When the answers and revelations come, they hit fast and hard. There is also wisdom and philosophy in this novel, as well as a wealth of wonderful quotes. 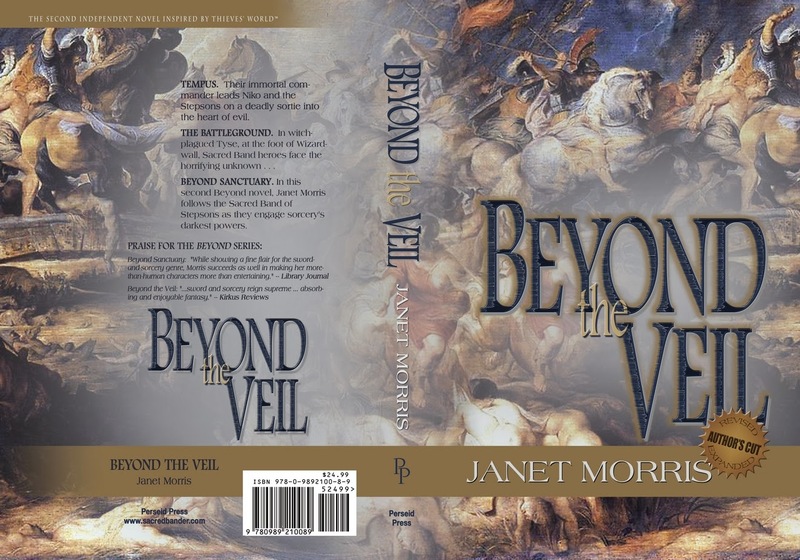 Janet Morris was determined that Beyond the Veil not suffer from what I call MBS — Middle Book Syndrome, and she has succeeded. More than that, halfway through the story, this novel goes from being as solid as its predecessor to upping the ante and raising the bar. 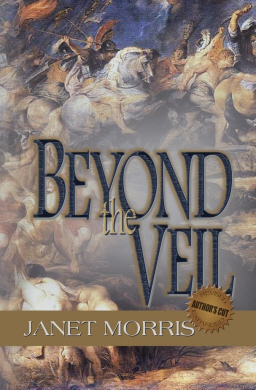 Now let me mention Janet Morris’s prose, her style, her approach. She is a musician, a bass player, and she writes with the ear of a musician. There is what I call “poetry of earthiness” in her prose, and a certain rhythm in her style. For example, here’s a passage, elegant in its simplicity, from a scene set in a whorehouse, that puts you right there. Gayle was here now — beside her among the bubbly pipes and smoke. Candlelight flickered with the drafts, glimmering on cup and shield rims, on blades and armor; snatches of intrigue; lovers cuddling in corners; schemers whispering in booths nearby; wisps of low connivance leaking out from a dozen paper screens. Gayle must know something, be useful in some manner. This place he’d chosen was one for confidences and calumny. She began to open him up with canny questions and careful flattery. And here’s a bit about Tempus that reveals something of his character, something of his past, without giving away the mystery of the one they call the Sleepless One. His presence, whether or not he takes center stage in a scene, dominates all. As a haughty young philosopher, ages ago, before the curse which had made him a tireless wanderer, bereft of sleep and love and what men call peace, Tempus had concluded that god is day and night, winter and summer, war and peace, satiety and hunger… Further, that out of all things can come unity and out of unity, all things. Tempus, Morris’s most famous character, her legacy character, is a stoic hero, a great warrior, a demigod… and philosopher. We get to know him, but not as well as we get to know the other members of the Sacred Band. Morris keeps the mystery, the enigma, of him there to tease us. He is not called Tempus the Obscure for nothing. And for all the glory of its flesh and blood characters, the beauty of prose, the literary depth and textures and levels of this classic, there is no shortage of inhumans, once-humans, half-humans, magic-working, mortals fighting in the streets, mage war, embattled gods, fire-spitting demons, shape-shifters, and a rousing night raid that reaches a powerful crescendo. Oh, yes… there’s also a golden homunculus, a creepy little thing that becomes the whispering master of one recurring character, and nearly succeeds in doing to Tempus what few men, few mages, have ever attempted. The final scenes involving a young warrior-woman who has found herself pregnant, and who is torn between keeping the baby or having an abortion, is played out perfectly, with restraint and delicacy, with compassion and humanity, and a deft touch that neither underplays nor overwhelms. 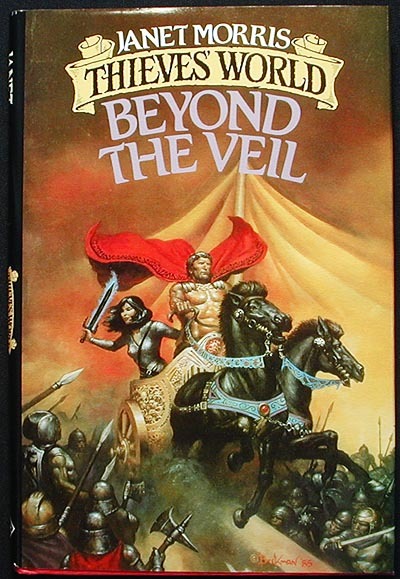 Once again, as I highly recommended the first book in this magnificent trilogy, I say that you will not be disappointed in this second book, Beyond the Veil. Life to you, and everlasting glory.